The quality of the machining and finish on this tool are excellent although my first impression was that the nice broad tang could be inserted further into the handle and that the handle itself could have been longer. That said, the tool is well balanced and comes pre-ground with quite an acute angled bevel - 30° - that cut well without further attention. 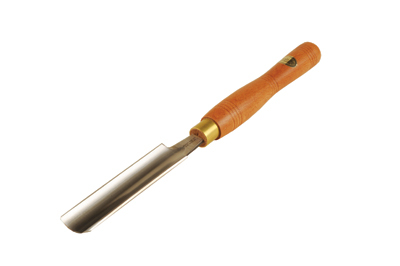 The flatter 'Continental' section of this tool is used extensively in Europe, whilst the deeper, rounder section roughing gouge with a typical 45° grind is far more common here in the UK. 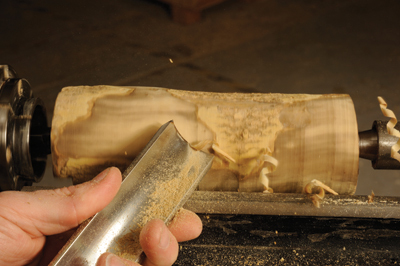 The grind on this gouge takes a little getting used to; initially I found I had a tendency to raise the handle lifting the bevel away from the wood and removing the support for the cutting edge. Once I had familiarised myself with the more acute grind I found the tool very effective at rapidly roughing down timber, both fresh/unseasoned and dry stock. Presented at an angle, as in a finishing cut, the gouge was superb â€“ the length of the bevel and acute grind angle means that it behaves more like a skew taking fine planing cuts. An excellent finish straight off the tool was easily achieved therefore minimising the need for sanding. In some ways this gouge is something of an oxymoron - it is capable of removing vast quantities of waste material quickly and without fuss yet also able to give fine, delicate finishing cuts equally easily. Despite both my initial concerns and some deliberately aggressive cutting - which the tool seems almost to encourage - it coped with this admirably and there was no evidence of any flex in the tang. For the tang to be inserted further into the handle would necessitate a much larger ferrule and a larger handle; I am not sure that this would have been comfortable. Why has it has taken so long for us to appreciate what the Continental Europeans have had for many years? This is a wonderfully versatile tool that is a 'must have' for the regular spindle turner albeit let down by, for me, too short a handle.